Our self catering cottages lie in the ancient Glamorgan parish of Cilybebyll, which lies on the eastern side of the beautiful Swansea Valley, some nine miles to the north-east of Swansea city. There a few places left like Cilybebyll. Rural and unspoilt, the sleepy hamlet consists of a parish church and no more than 25 residences. The cottages stand in a slight hollow about half a mile from the parish church and originally served as outbuildings on the Plas Cilybebyll estate. Plas is Welsh for Mansion. Our Cilybebyll Cottages are perfect for a walking holiday – beautiful countryside, spectacular views, winding country lanes and a wonderful quirky history. The name Cilybebyll is not pronounced ‘Silly Billy’ as one of our cottage guests joked. High quality anthracite coal has been mined in Cilybebyll for over a hundred years. In 2006, Basil ‘the homing horse’ of Cilybebyll made national headlines. The Welsh cob fled his new stables at night by sliding a bolt with his teeth, jumped a fence and trotted 3 miles down a main road, took 14 different turn offs and returned to his former home in Cilybebyll. 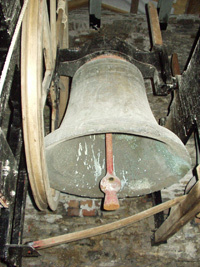 Cilybebyll Church bells are the second oldest ringing bells in Wales (the oldest dates back to circa 1430). In 1129, one of William the Conqueror’s knights gave Cilybebyll church to the Cistercian Abbey of Neath and returned to England, having found the Welsh people of Cilybebyll difficult to manage. The ancient churchyard in Cilybebyll is circular so that the Devil has nowhere to hide. In 1262 in consequence of the frequent wars between the Welsh and the English most of the lands of Cilybebyll were lying waste, the tenants killed and the mills burned. In 1315, a Welshman named Llywelyn Bren lead an uprising against the government of the Normans and started sporadic raids on Cilybebyll. He was finally captured and done away with at Cardiff Castle in the time of Edward II. Many claim that Cilybebyll means retreat of tents from the Welsh Cil = nook and Pebyll = tents, and it has been suggested that this is the place where the Romans at Neath spent their off duty time. It is far more likely that the name derives from the Irish Kil = church and Pebyll or Bebyll a personal name. Lots of cannonballs have been found in Cilybebyll – unloaded from carts when horses taking them to the coast got tired. The Cilybebyll Walk is very popular with walking clubs and tourists. Geocaching enthusiasts visit Cilybebyll – there area a series of caches hidden around the hamlet. During the Second World War, a group of men from Cilybebyll hid in an underground hideout (now a Scheduled Ancient Monument) in private woodland at Plas Farm, awaiting the German invasion. A local newspaper once suggested that Tom Jones was house-hunting in Cilybebyll and that Madonna may like to have a holiday in the hamlet. A local lady who is 107 years old (in 2012) said that the tranquil hamlet is the only place she knows that hasn’t really changed since she was a child. A Cilybebyll farmer called Sid made the news headlines in the 1980s as one of the last farmers in Britain to work with horses rather than tractors.